Rebozo is a Mexican word for the shawl that is a woman's constant companion - day and night. 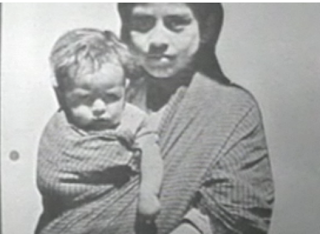 This shawl was commonly used to carry babies on mother's back. The fabric is simply tied in a knot, and placed around the mother's body. 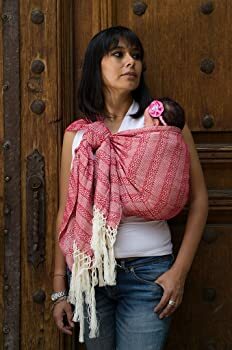 An amazing tool, a Rebozo provides your baby with a safe and secure place while participating in life with mom and dad. So simple, yet so elegant! First, pick out a suitable fabric. Look for a gorgeous print that you love, in a resilient and breathable cotton, silk or wool. It should be strong enough to hold your baby's weight, but still allow air circulation for when baby is all bundled up. If you aren't sure, place it over your mouth and breath through the fabric! You will need 2 7/8 yards (100") or 2.54 meters (254 cm) of fabric at least 29" (73.7 cm) wide. Fold your fabric over lengthwise, then measure and mark your fabric into thirds along the length. You should have three equal sections of about 33.3" (84.6 cm) long each. Next measure out the width at 14.5" (36.8 cm) in the middle third, and mark straight across the open side, parallel to the fold, with a pencil or piece of chalk. On the other two thirds, measure 12" (30.4 cm) from the fold, and draw a tapered line from the middle third to the outer measurement at each end. You can do a straight line or a slightly curved line. Pin the fabric together so that it doesn't move about, and cut along your marked line. This leaves you with a 1/2" (12.7 cm) border for hemming. Fold in the raw edge 1/4" (6.4 cm), then again another 1/4" (6.4 cm) and stitch. For an quick Rebozo trim, open up your fabric and simply add 10" (25.4 cm) of ready-made fringe at each end. You will need 3 1/3 yards (1,207 inches) or 3.04 metres (304 cm) of fabric. Before marking your Rebozo in thirds, mark off 10 inches (25.4 cm) for the fringe, at each end. Now follow the instructions above, within these two lines. Open up your fabric and sew two rows of stitching 1/4" (6.5 cm) apart, across the width at the 10" (25.4 cm) mark to reinforce it. Pull out the weft threads, which are the ones that form the cross-wise grain of the fabric, up to the 10" (25.4 cm) mark. Secure these newly released warp threads artistically, by tying, macrame, beading, etc. Mexican Rebozos are highly valued for the artistry that goes into this fringe. The expense and prestige of the Rebozo increases with the time put into the fringe. The best Rebozos have hearts, stars, ducks, donkeys and other geometric patterns knotted into the fringe. Some have been embroidered with rural scenes flowers and animals, stories, religious experiences, to name a few. For those adventurous souls, you can even dye your own fabric, using natural dyes of green walnuts, indigo, iron, molasses, and cochineal. It is said that the beauty of a Mexican woman is to be judged by her braids and her Rebozo . 1. Buy extra fabric to compensate for shrinkage and the fact most fabric isn't cut straight. Cut it down to measure yourself. 2. Straighten the grain before sewing by pulling on diagonally opposite corners of the fabric. 3. Pre-shrink your fabric before cutting. • What Can You Do With a Rebozo?